Music lovers will often tell you that Roland's TR-808 gave birth to modern music. Acid house, rap, techno and other genres owe some of their original (and even current) sounds to that synthetic beat. 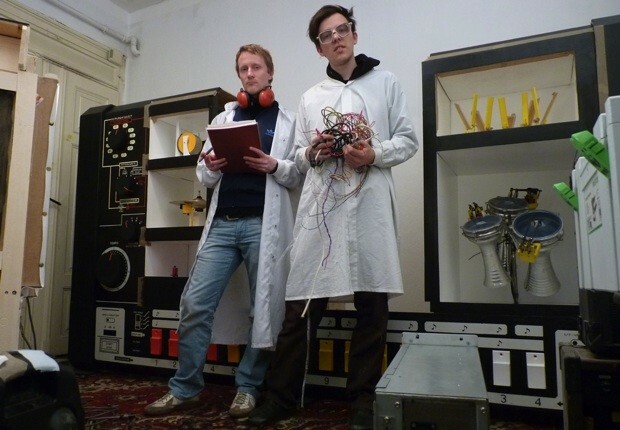 Moritz Simon Geist appreciates the effort, but has built a solution for those who think the drum machine is a little too perfect: his MR-808 installation has robot limbs playing all the equivalent real-world instruments, right down to the cowbell. A laptop musician at the helm sends MIDI input to an Arduino controller that then triggers the robot's instrument motors and matching lights. The effect is a unique mix of flawless cues with imprecise, almost organic sounds -- imagine 808 State or Kanye West replacing each and every machine with a live band and you've got the idea. Although the sheer size of the MR-808 sadly nixes chances you'll ever see one at the local nightclub, it could give any of Geist's recorded music one of the more distinct vibes we've heard. MR-808 recreates Roland drum machine with robot instruments, puts them in an 808 State (video) originally appeared on Engadget on Wed, 07 Nov 2012 18:36:00 EST. Please see our terms for use of feeds.